The Safety Expo at Safety Fest TN is rapidly filling up. This unique boutique-style exposition, with just 46 spaces, is not a maze of 100s of exhibitors. And, it helps make possible the implausible – providing a week of free safety training. Last year 2,806 seats were registered by 1,001 people representing 250 organizations from 93 cities in 14 states. 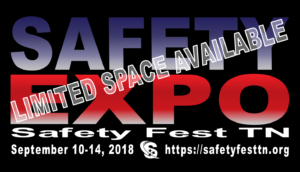 For the past three years, the Safety Expo has filled up weeks before the event. Organization may be promoting environmental, safety, and health products, processes, or services for work, home, and the community to internal or external clients.